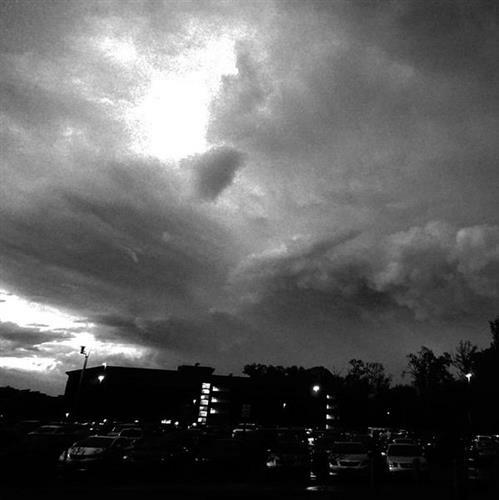 A Tornado Watch for the D.C. area expired as storms moved through the region Monday evening. 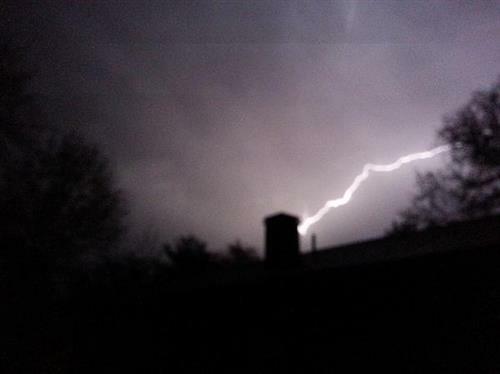 The fast-moving storms brought lightning and hail to some areas, as well as strong wind gusts. POWER OUTAGES: As of 3:45 a.m.
*Dominion Power lists 729 customers in Northern Virginia as being without power. *Pepco outages: 65 customers in D.C., 129 customers in Montgomery County and 34 in Prince George's County. 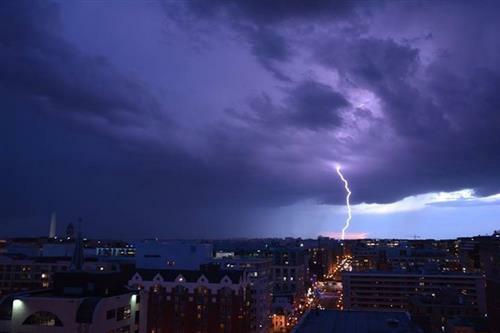 Strong storms moved through the D.C. area Monday evening, bringing lightning and hail to some spots. At 10:20 p.m. Monday, a Flash Flood Warning was cancelled for central Spotsylvania County, south central Stafford County, and the City of Fredericksburg in Virginia. UPDATE: April 20, 2015, 9:35 p.m.
A Tornado Watch remains in effect until midnight but only isolated severe storms are anticipated. The main threat currently is damaging wind and large hail. A Severe Thunderstorm Warning is in effect until 10:15 p.m. for northeastern Charles, south central Anne Arundel, Prince George’s, northwestern Calvert and northern St. Mary’s counties. A Flash Flood Warning has been issued until 12:15 a.m. Tuesday for central Spotsylvania County, south central Stafford County, and the City of Fredericksburg in Virginia. The area will see scattered storms until until around 11 p.m. or midnight. Some may produce lightning, hail and brief heavy rain. 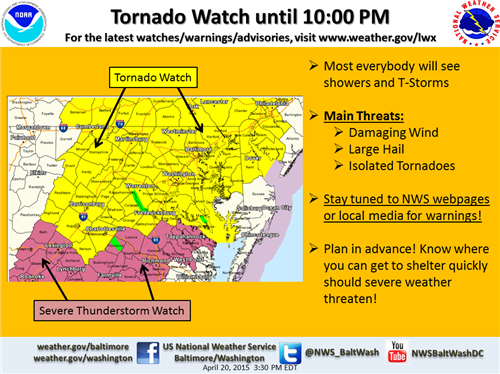 EARLIER: April 20, 2015 4:30 p.m.
WASHINGTON — A Tornado Watch has been issued for the D.C. area until 10 p.m. EARLIER: April 20, 2015 8:30 a.m.
WASHINGTON — We had a good dose of rain overnight, with Ronald Reagan Washington National Airport picking up about 0.83 inches of rain. While the rain continues to taper off and push to the northeast through the morning, more rain is in the forecast for this afternoon, so keep those umbrellas handy! Wet roads from the overnight rain will eventually dry as we continue into Monday morning. A warm front over central Virginia will lift to the north through the first half of the day, putting the WTOP listening area in the warm sector. Temperatures will shoot up to around 80 degrees for daytime highs. In this case, receiving some sunshine Monday afternoon isn’t so good. It will only aid in the destabilization of the atmosphere, making it juicier while creating a better chance for some strong to severe storms this afternoon and evening. The storms will all trigger from a trough aloft and a cold front that will sweep through from the west to the east later this evening. Gallery: Stormy skies, rainbows hit D.C.
A storm hit the D.C. area on Monday. Check out some of the amazing photos from around the region. Correction: Tornado Watch canceled for entire #WTOP listening area. Counties now are on Eastern Shore of MD and watch is til Midnight. Lightning video provided by a WTOP listener. Severe wx threat has diminished, but a few isolated showers/storms remain possible over the next few hours with gusty winds and small hail. Severe weather late Monday has moved out of the region with a cold front. For the rest of the work week it will be relatively quiet and cool with breezy conditions, especially during the afternoons. Tuesday will be a pleasant spring day with plenty of sun, highs near 70 and a bit of a breeze. Another cold front will likely set of a few showers later in the day Wednesday. However, this front won’t pack as big of a punch and there is only an isolated storm chance, mainly south of Washington. More importantly, this front will bring in even cooler air that will last on into the weekend. Highs Thursday through Saturday will only warm into the low 60s, with Sunday potentially struggling to get out of the 50s.